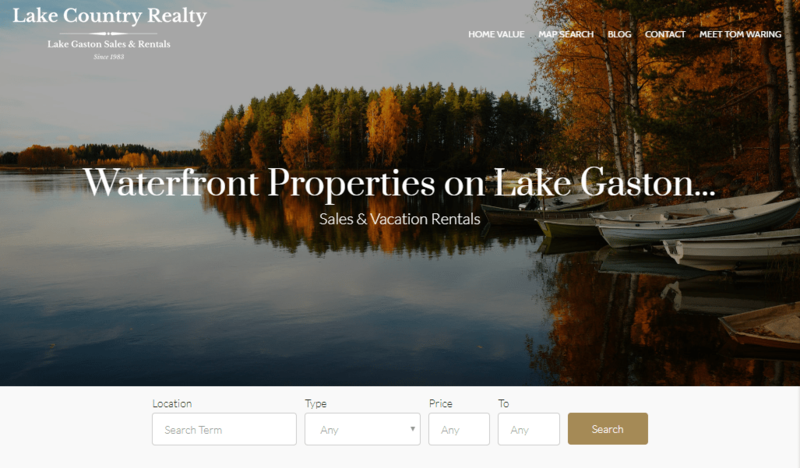 A WordPress IDX website is a website that connects to the MLS and lets visitors search available property listings. This type of site is ideal for independent agents who want to capture leads using their own domain. To build one, sign up for hosting, choose an IDX WordPress theme, and then customize the design. An internet data exchange (IDX) website can be a waste without reliable hosting. To ensure you have an easy-to-use hosting service with one-click WordPress installation, consider Bluehost. It offers web hosting packages starting at $2.95 per month, plus 24/7 customer support and a 30-day, money-back guarantee. Start building your site on Bluehost today. What Is an IDX Website? An IDX (Internet data exchange) website is a standard real estate agent site that allows users to search property listings sourced from the multiple listing services (MLS). This functionality is made possible by an IDX-enabled theme which displays listing information in an attractive layout. Once visitors see a listing that they’re interested in, they can reach out directly to the agent via a contact form and request more information, helping real estate agents get more leads. 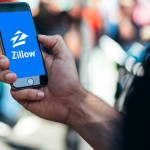 The direct connection to the MLS is advantageous for agents because it populates their current listings on their site automatically; no upkeep is required. These listings typically include things like property features, amenities, and photos. 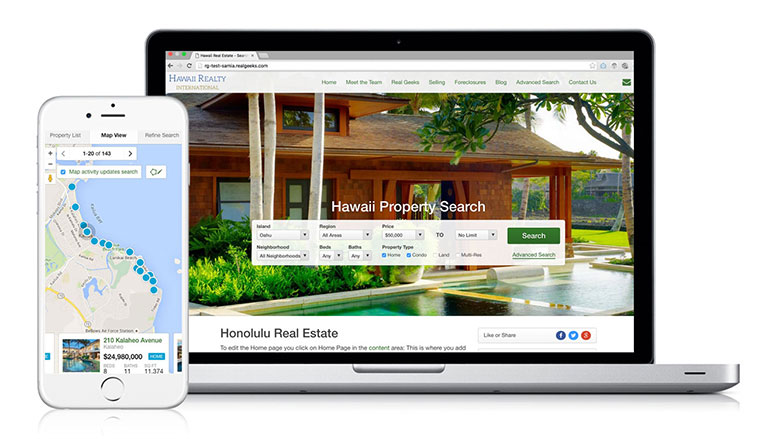 While visitors can browse listings easily, most IDX websites also allow them to search based on a number of criteria, including the number of bedrooms and bathrooms, property size, unique features, and location. MLS listings that you can display on your IDX site aren’t limited to detached properties or for sale properties. Agents can use various selection criteria, set within the IDX plug-in, to feature a number of different properties, such as apartments, condos, attached homes, or parcels of land. IDX Website from Real Geeks (image via website). To build your own IDX real estate website, you must first select and register a domain name with a host. Once your hosting is active, install WordPress as your website building platform, install and activate your IDX theme, add necessary plug-ins, and customize your site until you have the look and feel that you want. Be sure to add your logo for clear branding and contact information to ensure all leads are easily captured. Here are the 12 steps needed to build a complete WordPress IDX real estate website. Before setting up your IDX website, you will need to find a website host and pick a domain name. A domain name is the web address where potential buyers will access your IDX website, typically formatted as www.businessname.com. Web hosting is the service that stores your website files and makes them accessible to site visitors. We recommend using Bluehost for your hosting — it’s very affordable at less than $3/month and includes one-click WordPress setup. Additionally, it comes with five business email addresses and domain privacy to ensure you don’t get spammed. To get started, go to Bluehost.com and select a plan that fits your needs from the “Hosting” menu tab. The Basic plan should be sufficient for most real estate IDX websites; you get 50GB website storage and five business email addresses. For teams or brokers who need more than five email addresses or want additional website space, consider the Plus plan. Once you select your plan, you’ll be prompted to search for a domain name. If you have an existing brand or agent name, select a domain that is as close to that real estate agent brand as possible. For agents or brokers without a brand, this is an ideal time to create a domain that makes your agency easy to remember. You can also use the search widget below to check availability. IDX feature of a realty website, built using Diverse Solutions. Once you’ve found an available domain name that suits your IDX real estate website needs, select it and move through the purchase process. 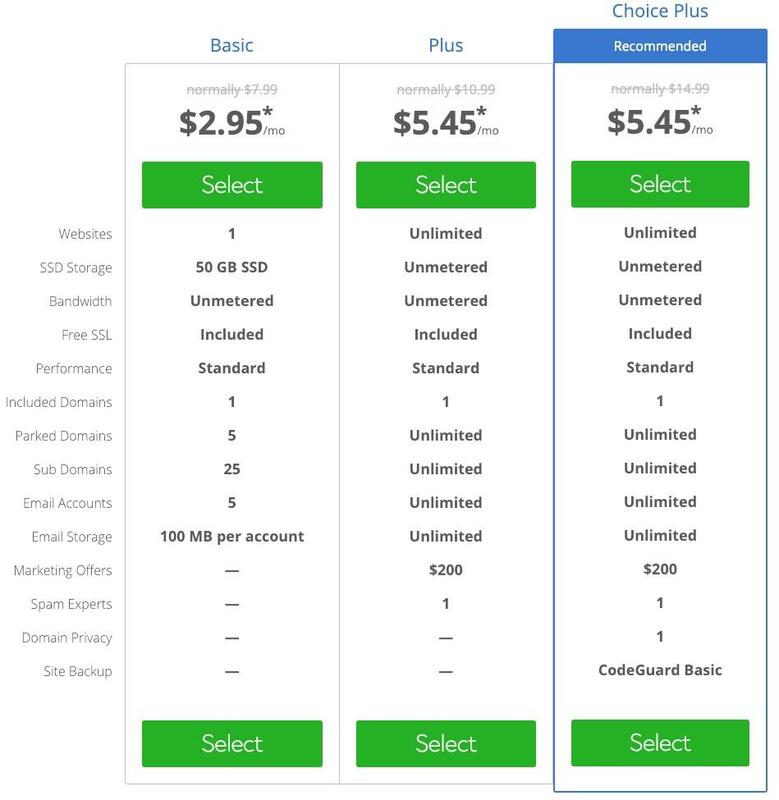 Bluehost will ask you to choose your account plan of either 12, 24, or 36 months and select any add-ons — like domain privacy. Make your final selections, input payment information, and complete your purchase. Inside your Bluehost account, navigate to the “Website” menu and click on “Install WordPress.” You will be prompted to click “Install” again to start the process of adding WordPress to your Bluehost account. Next, specify which domain you want to install WordPress. For real estate agents with only one domain name in their account, check to make sure that the default is the correct one. For agents who bought several domain names, use the domain name that you want to use in printed materials and online searches. Once the installation is complete, you’ll be able to access your site’s WordPress dashboard with one click through your Bluehost account. WordPress offers IDX-enabled themes that are easily customizable with a logo, text, photos, and pages. To find one that fits your brand and business, consider your website needs, and then select and download a theme from a theme database and, finally, install the theme. Before you select and download a theme, consider the features necessary for lead generation and optimum user experience. Keep in mind that you want easy navigation, customized searches, and an attractive, uncluttered design. Also, think about the need for social media integration, search engine optimization (SEO)-optimization tools, contact forms, and dynamic content widgets like sliders. 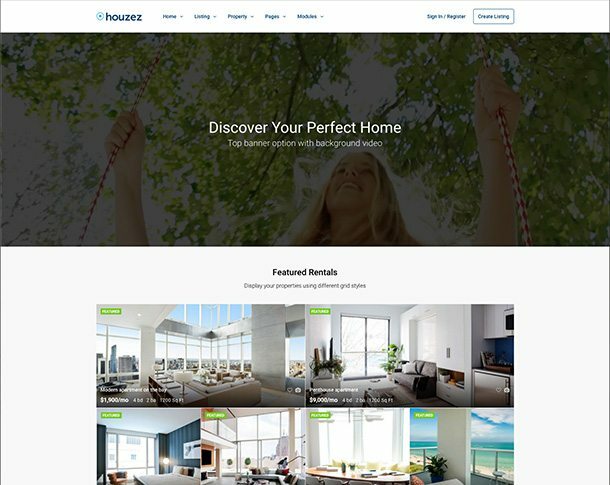 Once you’ve made a list of your ideal theme’s functions and features, begin browsing WordPress theme stores to find the best one for your real estate brand. You want to find a theme that requires minimal customization and comes feature-rich without the need to install a lot of third-party plug-ins. When you find a theme you like and meets your expectations, add it to your shopping cart and go through the payment process. After payment, the template site will prompt you to download it as a .zip (archived) file to your computer. It’s recommended that you download your theme to your desktop for easy accessibility. 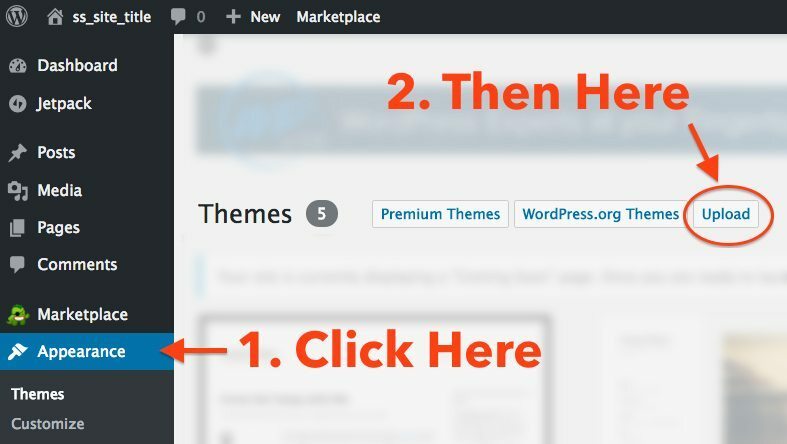 To install your theme, pull up your website dashboard by accessing it via your Bluehost account, or by navigating to yourbusiness.com/wp-admin — replacing the dummy domain with your own domain. Log in using your WordPress credentials as provided to you by Bluehost. Plug-ins add functionality to your site, enabling you to add dynamic elements like slideshows and specialty forms that are not native to your theme. If you found an IDX real estate theme that you like, but it still does not offer all of the functionality you noted in Step 3, then consider looking for a plug-in to meet those needs. Download a .zip file of these plug-ins from their respective pages; be sure to save the files to your desktop. If you need additional plug-ins, visit the Envato plug-ins page. then “Add New.” Once you’re on the Plugins page, click on “Upload Plugin” at the top. Upload each .zip file for the plug-ins you downloaded, then click “Install.” Activate the plug-ins by returning to the Plugins page and selecting “Activate” below the name of each new plug-in. Plug-ins within your WordPress theme. While you have already downloaded an IDX-enabled website, you may need an IDX plug-in to display MLS information in real-time on your site. Confirm this by reviewing theme documentation; some themes have this functionality built in. If not, there are several plug-ins that will display listing information on your site, available at Envato or other plug-in sites. Learn more by visiting WordPress IDX providers. After you have found the IDX plug-in that you want, download it to your desktop. To install it, go to “Plugins” and click “Add New” on the left-hand menu bar. Upload the file you just downloaded and click “Install.” Be sure to activate it on the Plugin page as well. Example of an IDX plug-in from Diverse Solutions Mapping. After installing your IDX real estate plug-in, you need to install the demo content to make it easier to visualize the design; this helps you figure out what you need to edit. To install the demo content for your IDX website, go to your dashboard and click on “Theme Options.” Find and click on “Demo Importer” and navigate to the demo you’d like to install. Click on “Import Demo” to install it. Most WordPress themes have a number of different demos or versions to choose from that each has different layouts, fonts, and features. Look over your theme and choose the demo you think will work best with your brand. Keep in mind you can always change fonts, colors, and layouts. The first thing to do when editing your website is to add your real estate logo. If you don’t have a logo, you can either create your own logo or pay a freelancer at Fiverr to do it for you. Once you have your logo and have added it to your site, add your contact details for easy outreach. If you don’t already have a logo, make it a priority to get or create one. There are plenty of good logo design inspirations in the real estate industry, but keep in mind that your logo should be a visual representation of you and your services. The best logos have specific sizing that fits within website headers. To ensure your logo will work on your site, make sure it is no fewer than 200 pixels wide and 75 pixels tall with a transparent background, typically in .PNG format. Keep in mind that you do not have to add your logo and contact information on every new page; WordPress themes will auto-populate your logo on all pages. Next, add your name, agency name, phone number, and email address with social media icons in the footer of each page. To do so, click on “Appearance,” then click on “Widgets” in the sidebar. As you’ll note, there is at least one tile named “Footer.” If you have more than one, select the first one and expand it. If you have an available widget on the left-hand side called Contact, drag and drop it into the Footer tile, then update with your contact information. If you do not have a Contact widget, then drag and drop a Text widget into the Footer tile and enter your contact information. 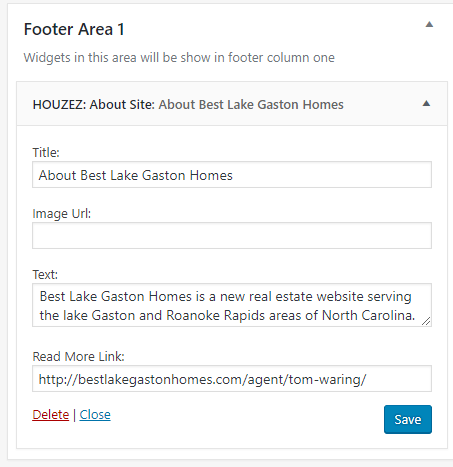 Adding contact information to footers in your WordPress theme. To add either a static image or a slider, download and install the Slider Revolution plug-in if you haven’t already. The plug-in comes with a standard photo. To change the photo, go to your WordPress dashboard and click on “Slider Revolution” in the gray left menu sidebar. An upload screen will allow you to pick a new image — or several — for your slider. Each image should be 1024×648 pixels to work in the Slider Revolution plug-in. The more images you use in the slider, the longer it will take to load. To make sure our page loads quickly, consider limiting yourself to three images. You can customize these images with overlaid text and animations. For full instructions on how to set up a Slider Revolution slideshow, visit its webpage. The types of pages you want depend on your real estate goals and whether you are creating an IDX real estate website for yourself or a team. Consider adding both informational and transactional pages, including an about us or about me page, contact page, testimonial page, listing pages, and a blog. An about us page introduces buyers to your realty office. Typically, these pages would start with three sentences introducing yourself to the buyer followed by a brief backstory of how you became an agent or how/why you started your agency. A contact us page is a simple page that includes all of your key contact information like phone number, email address, and office address. Some real estate agents add a contact form to save potential leads the hassle of having to send an email on a separate application. The contact us page is a good space to embed a Google Map with your office location to encourage drop-ins and establish credibility in your area/neighborhood. A seller lead generation page is a way to capture potential home sellers by offering them an attractive tool or report. For example, seller landing pages will often feature home valuation information, a comparative market analysis, and area sales data. Visitors can access these reports by submitting their contact information via a simple contact form. A seller lead generation page can be invaluable once you start advertising on Facebook or Google Ads to generate seller leads. Many real estate agents create ads on Facebook that send your leads to the lead generation page once they click on the ad. Once there, prospective sellers will leave you their contact information in exchange for one of your valuable reports. Your blog is one of the best ways you have to increase your real estate website’s ranking on Google. Write useful articles and neighborhood guides that will rank highly for very specific searches on Google; this increases clicks that, in turn, increases brand awareness and leads. For example, someone might be searching for “the prettiest blocks on the Upper West Side.” If you have a great article talking about that exact thing, you’ll likely get a site visitor and possibly a new lead. Our ultimate guide to Real Estate SEO teaches you more about using SEO to get your website ranking on Google. A testimonials page has all of the great reviews and testimonials you’ve received from past clients. The endorsements from past clients are often a huge factor in converting cold leads to warm leads — and possibly, sales. Read our guide to help you get more testimonials and real estate agent reviews. One of the best ways to get your IDX real estate website to rank well on Google is to create specific neighborhood listing pages with school info, community events and, as much interesting area information as possible. This makes you a neighborhood authority, which is an effective tactic for securing leads in micro-neighborhoods, waterfront home developments, or golf course developments. When creating effective neighborhood pages, the key is to figure out what people in your farm area are searching for and offer them a useful page with up-to-date listings. For more information, check our article on real estate keyword research. After deciding what pages you would like to include on your website, the next step is to create them. To do this, go to your dashboard and click on “Pages” in the sidebar. 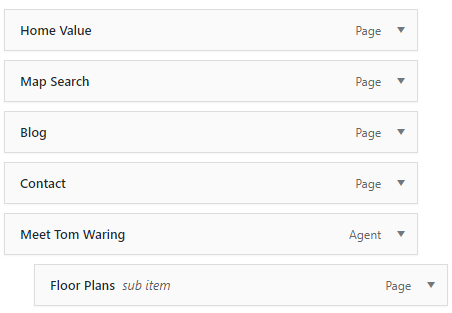 To edit a page from a template, click on “All pages” and choose the page you want to edit. To change the title of the page, click in the text box right above the Visual Composer icons and type in your new page title. Change the title of the page. To add additional content, drag and drop new “elements” onto the page using Visual Composer; this can include text, image, videos, a listing search field, or code. For example, the “Welcome Home” text in the middle of the page is in a text box element. To edit the text, hover over the green bar and click on the pencil icon which will open up a Microsoft Word-style text editor. Here, you can edit the copy just like you would using Microsoft Word. If you want to add pictures, click the “Add Media” button. If you’d like to add a contact form, click the “Add Form” button. When you’re done, click “Save Changes,” and you will be returned to the full-page Visual Composer view. Once you have copy and page elements where you want them, click on the “Preview” button on the right side of the page to see what it will look like on your website. 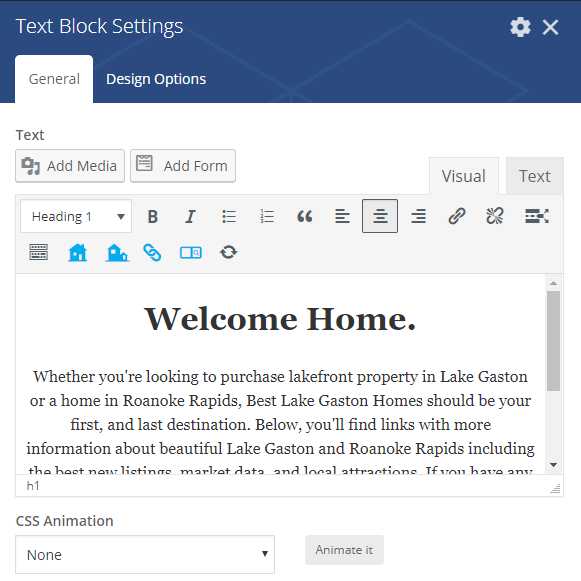 If you’re happy with the way it looks, go back to your Visual Composer page editor and click on “Publish.” Once you click “Publish,” your page will be live on your IDX real estate website. Start by selecting a menu you want to edit. You have four options: Main Menu, Footer Menu, Pages Menu, and Help Menu. The Main Menu is what will appear at the top across the entire site, so be sure you create this first. 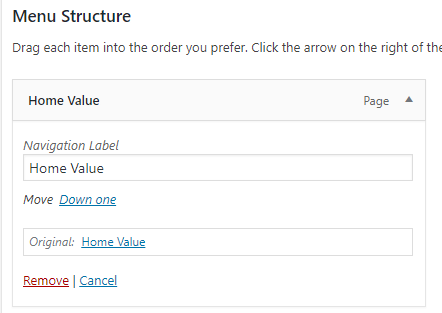 Once you have all the pages you want in your menu, you can now drag the pages up or down to determine what order they show up on the top bar of your site. 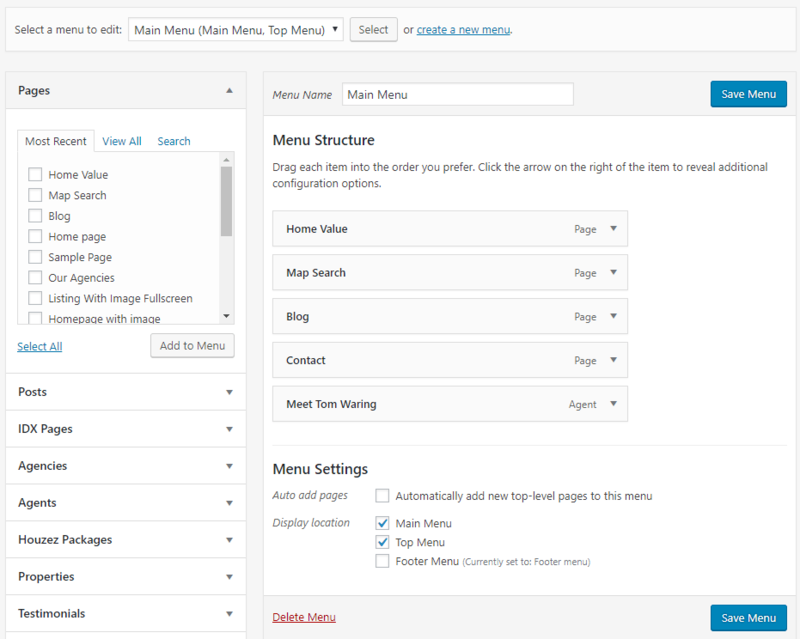 By default, WordPress uses the name of the page as the name that will show up in the menu, but you can adjust this by editing the Navigation Label for each menu item. A nested menu is a secondary menu that drops down from main menu pages to help you categorize your website content. To create a nested menu, add a page to your menu, then drag it over the page you’d like to nest it under and hold it briefly. Once you let go of the mouse, the page will be nested under the main menu page. 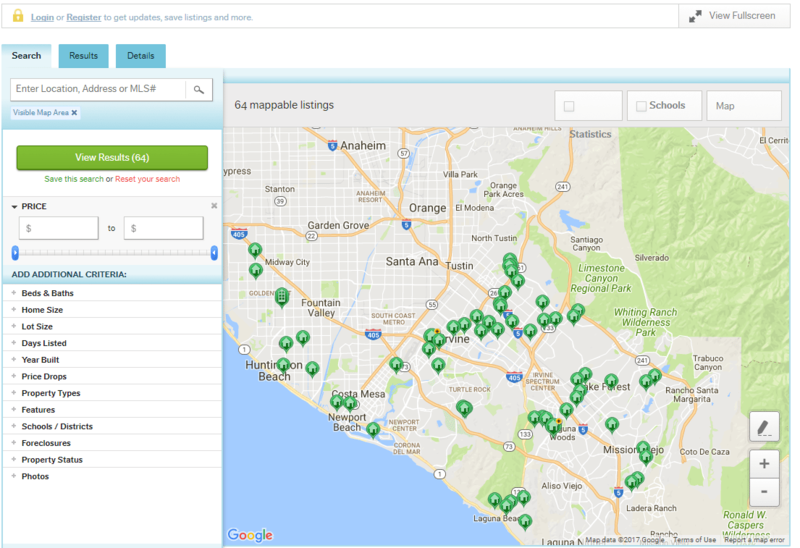 Nested menus are a great place to add your newly created neighborhood pages with IDX listings. For example, you might create a menu page called “Listings,” and then nest each neighborhood page you’ve created under it. After you have made your final edits and tweaks to your new website, navigate around it as if you were your targeted user. Open a browser and type in your domain name. Explore the pages, the forms, and the listings to make sure everything is working properly. Try several different browsers to see if the site displays well on Chrome, Internet Explorer, Firefox, and Safari. You should also review your site on a mobile device to make sure it’s fully responsive. And to make certain there aren’t any design or functionality issues, send your friends your domain name and ask them to browse your site and provide feedback about copy, images, and usability. Does an IDX Website Cost More Than a Regular Real Estate Agent Site? You do have to pay extra for the separate IDX website connection that keeps your site connected to the MLS and updated with new properties. You will also likely need to pay for plug-ins that add additional functionality. Are There Other Platforms Than WordPress for an IDX Website? Real Geeks and Placester are non-WordPress IDX website solutions that are easy to edit and include lead generation options but offer limited design options. 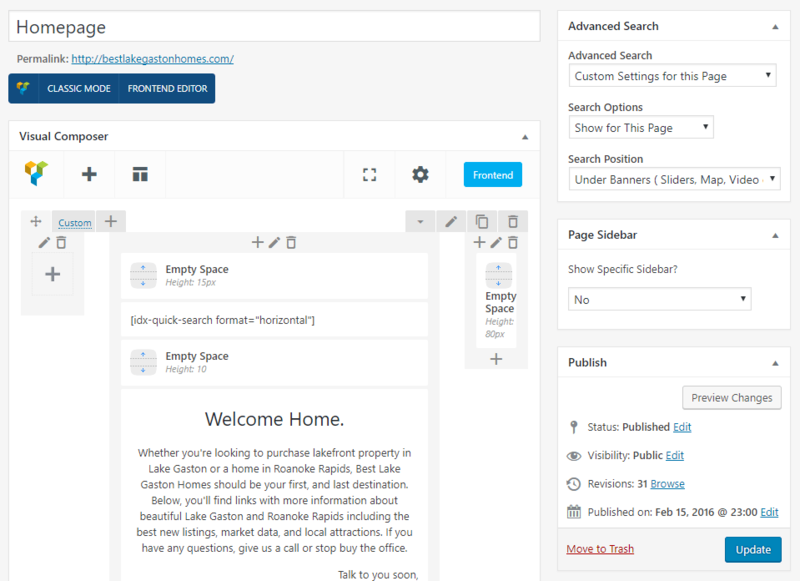 WordPress is specifically for agents and real estate agents who want full control over the design of their site. Would .Realtor Be a Good Domain Name Extension for My Site? The gold standard of IDX real estate website names remains .com. Even though there has been a lot of hype around the “.realtor” domain names, you should always go with a “.com” domain if possible to avoid confusion and to ensure your brand is represented professionally online. An IDX real estate website is a standard site used by real estate agents to list properties through a connection with the MLS. Because the listings are updated automatically, real estate agents do not have to spend any time on upkeep. Plus, WordPress IDX websites make it easy to launch a site that matches your brand and delivers what leads want — complete, attractive listings and seller tools. Too many real estate agents get caught up in website design and forget that web hosting is critical to their lead generation success. Many even experience site crashes that make online lead generation through their website impossible. That’s why Bluehost is a recommended option. At less than $3 per month, real estate agents get a full website with 99.9% uptime, business email, security, and a free domain. Click here to learn more and sign up. Great summary of the process. “Build” or “buy” is a common decision many have to make, and this certainly explains how to “do it yourself”. Of course that’s great if you have the time to invest. But even if you do have the time, you should really consider the COST of your time. OK, so you can create a website in a weekend -perhaps 5 hours each day…. At $40 per hour (for example) you are already in to a $400+ investment (in reality it may be a lot more). What many agents don’t realize is that there are awesome semi-custom WordPress website solutions already loaded with powerful, SEO-friendly IDX for the same price, I like to help agents succeed by helping them spend their time getting the marketing solutions they need to support their marketing and sales objectives. In my opinion, an Agent’s time is better spent considering their marketing and sales strategy and directing those thoughts and energy to a technician who can then create WordPress websites solutions that support their strategy. You are great for making good deeds and helping others. I am going to build a web site based on what I have learned from you. I could not refrain frokm commenting. Ꮤell written!